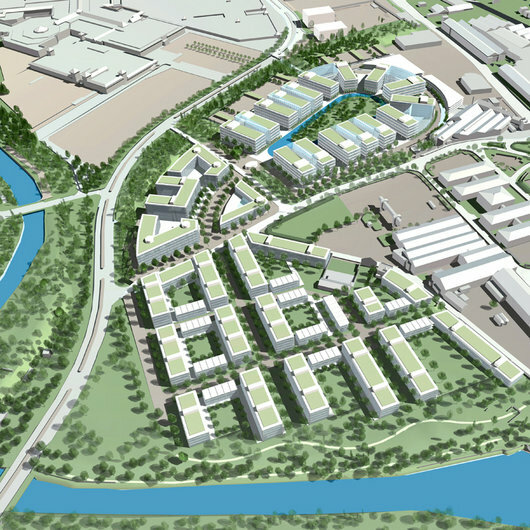 Hopkins have recently submitted a planning application for a mixed use and office campus masterplan set in the River Don Valley on the outskirts of Sheffield. The proposal will kick-start regeneration of the surrounding district which over recent years has suffered a down-turn in industry and lack of investment. The vision of a new sustainable business and residential community will be formed around a neighbourhood hub with public spaces and streets uniting disparate and irregular plots into a cohesive masterplan, extending links into the surrounding area and increasing permeability and connectivity. A new urban character will be created, strengthening existing landscape features of the river, embankment and connecting into the wider setting.